Over the last decade, several studies identify significant subsets (20-30%) of FMF symptomatic patients who carry only 1 MEFV mutation. These individuals have FMF symptoms that respond to colchicine. These studies include an NIH study by Booty et al (2009 Arthritis & Rheumatism), Marek-Yagel (2009 Arthritis & Rheumatism), a study of French patients by French by Kone-Paut et al (2009 Rheumatology), a study of Armenian patients by Moradian et al (2010 J of Human Genetics), and a study of Western European caucasians by Federici (2012 Annals of Rheumatology Disease). There are a wide number of MEFV mutations linked with FMF. Across all FMF patients, nearly around 80% of MEFV mutations are accounted for by E148Q, M680I, M694I, M694V, and V726A. The percentages for the particular mutation in single mutation cases differ by the population under study. In a study of Turkish patients by Ozdemir (2011 Molecular Biology Reports), 43% displayed the M694V mutation, 20% the E148Q, 15% the M680I, and 11% the V726A (11.32%). The studies also indicate that individuals with 1 MEFV mutation exhibit symptoms that are often less severe than individuals with 2 mutations. Also, individuals with 1 mutation show higher levels of other inflammation markers than individuals with no mutation, including among “healthy” individuals with 1 mutation. Studies are beginning to appear in the literature that attempt to identify the reasons that the typically recessive MEFV mutation begins to behave as if dominant, thereby causing the clinical symptoms of FMF. A review of the efforts is provided by Touitou (2013 Journal of Medical Genetics). One general theme is that the relationship of inheritance and disease expression is more complex than suggested by the simple classical model of genetics (Booty et al 2009). Instead, the body of evidence is suggesting that the environmental and “epigenetic” sources (molecular changes other than the underlying DNA sequence) are important in triggering disease expression in patients with single mutations. A statistical evaluation of FMF patients by Jeru et al (2013 PLOS) lends support to this idea, suggesting that while single FMF patients show higher disease expression than individuals with no mutations, very careful analysis shows that the single FMF mutation is not the “cause” of FMF symptoms by itself in the classical sense of inheritance. The process of recessive genes causing disease as if dominant is not unique to FMF or fever syndromes. There are ongoing studies of recessive to pseudodominant process in under study in a number of diseases. A search of Google Scholar for autosomal recessive to pseudodominance returns a number of current studies. Aslan. Familial Mediterranean fever with a single MEFV mutation: can a deletion resulting in α-thalassemia be the cause? Journal of Human Genetics, 2011: 56, 169-171. Booty, et al. Familial Mediterranean fever with a single MEFV mutation: Where is the second hit? Arthritis & Rheumatism 2009: 60, 1851–1861. Federci et al. Clinical impact of MEFV mutations in children with periodic fever in a prevalent western European Caucasian population. Ann Rheum Dis 2012;71, 1961-1965. Kone-Paut et al. The clinical spectrum of 94 patients carrying a single mutated MEFV allele. Rheumatology (Oxford) 2009: 4,: 840–842. Lachmann et al. Clinical and subclinical inflammation in patients with familial Mediterranean fever and in heterozygous carriers of MEFV mutations. Rheumatology (Oxford) 2006; 45, 746–50. Marek-Yagel et al. Clinical disease among patients heterozygous for familial Mediterranean fever. Arthritis & Rheumatism 2009: 60,1862–1866. Moradian et al. Genotype-phenotype studies in a large cohort of Armenian patients with familial Mediterranean fever suggest clinical disease with heterozygous MEFV mutations. J Hum Genet 2010: 55, 389–393. Ozdemir et al. Prevalence of known mutations in the MEFV gene in a population screening with high rate of carriers. Molecular Biology Reports, 2011: 38, 3195-3200. Ozen. Changing concepts in familial Mediterranean fever: Is it possible to have an autosomal-recessive disease with only one mutation? Arthritis & Rheumatism 2009: 60, 1575–1577. Touitou. Inheritance of autoinflammatory diseases: shifting paradigms and nomenclature. Med Genet 2013;50, 349-359. Touitou. The spectrum of familial Mediterranean fever (FMF) mutations. Eur J Hum Genet 2001; 9, 473–83. 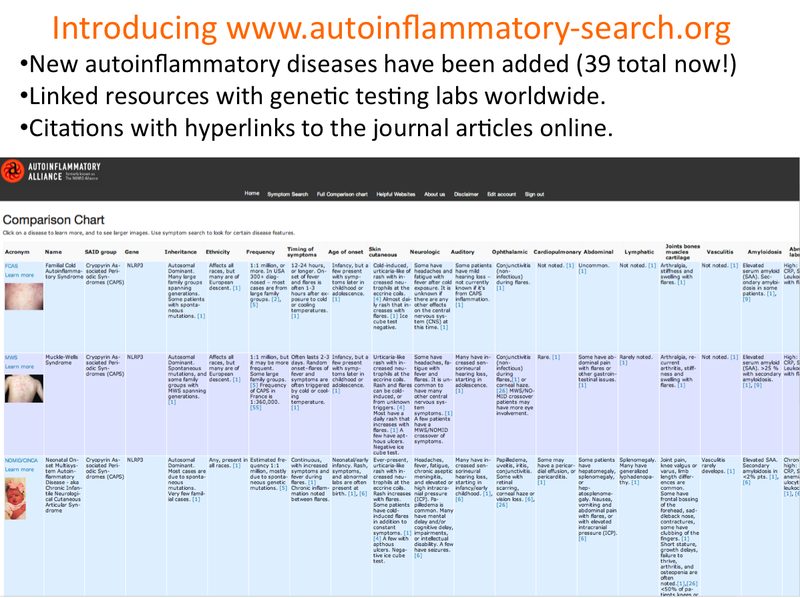 Introducing Our Newest Addition: autoinflammatory-search.org!